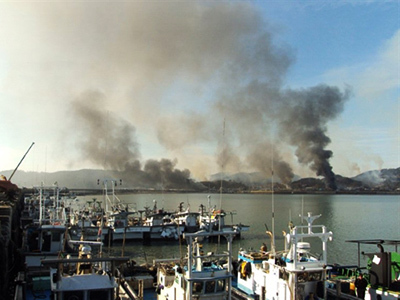 North and South Korea engaged in direct conflict on November 23 after the North shelled Yeonpyeong Island, which rests near the two states’ sea disputed border. The North’s attack killed at least two South Korean military members, injured civilians and destroyed a number of buildings. The assault was allegedly a warning from Pyongyang as the North was aggravated by the South’s military drills in the area. Investigative journalist Wayne Madsen linked the event to the simultaneous rise in the US dollar. “The only thing really backing the US dollar is America’s huge military power, so there is a tendency to invest more in the dollar than in other currencies when situations like this occur,” he explained. Both the North and South are still technically in a state of war governed by an armistice. Tensions on both sides are on the rise, with less of an effort being given towards diplomacy by the current South Korean government. Madsen has previously argued that many of these events between the North and South have ulterior motives. Discussing the March sinking of the South Korean Cheonan, an act an international report blames the North for; Madsen argued there are many questions left unanswered. “Maybe Lee Myung-bak, the South Korean President, did this in concert with the United States with then Prime Minister Hatoyama of Japan not to kick out the US from Okinawa. He reneged on his campaign promise, he had to resign,” he said. Madsen argued Myung-bak is taking advantage of the lime light to settle scores, and highlight South Korea as a victim following a strong positive showing on the world stage. “It’s politics,” he argued. Webster Tarpley, an investigative journalist, explained that the incident occurred on a disputed border as South Korean military drills were under way, and he believed who shot first and who violated who’s border is still something to be disputed. The Japanese and South Koreans are rushing to the dollar, making it a stronger currency, because they fear the Euro dues to the Irish crisis, argued Tarpley. The global financial condition is connected to ongoing military and political events internationally. He alluded that the incident off the coast of the Korean Peninsula, the rise in US currency, and the economic recession in Ireland and ongoing global financial woes are all related. “The US classically uses North Korea as a gambit. You can prod North Korea into doing things and once you’ve got that going the Japanese and South Koreans have to be more dependent on the US,” said Tarpley. And with the Euro in danger due to failing banks in Ireland, the US dollar is the best option.